Welsh swimmer Georgia Davies is aiming to compete in her third Olympic Games following the most successful major championship of her career. Davies, 27, won four medals at the European Championships in Glasgow, including two golds. The Commonwealth Games bronze medallist believes she is still improving as she aims to compete at Tokyo 2020. “I would like to see myself there but there will be a lot of hard work between now and then,” said Davies. 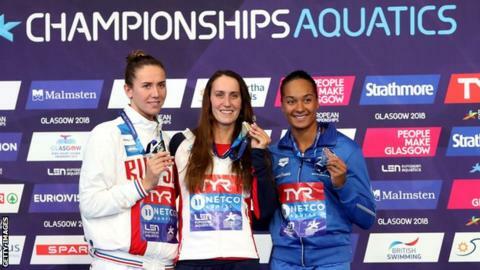 Davies won 50m backstroke gold – having set a British and European record in the heats – in Scotland before a 100m silver with another personal best time. Another gold in the 4x100m mixed medley relay and bronze in the women’s equivalent followed. This quartet of medals followed Commonwealth bronze on the Gold Coast in April. “It (Glasgow) could not have gone much better,” said Davies. Getting older has also helped Davies cope with the pressure of performing on the big stage. “At my first Olympics (London 2012), I buckled under the pressure and did not rise to the occasion,” she said. Davies’ favoured 50m backstroke event is not in the Olympics but there could be another new medal chance in Japan. The 4x100m mixed medley relay event is now an Olympic discipline and Davies could line up alongside Adam Peaty in Japan, just as she did in Glasgow for the European gold. “I enjoy racing with some of the best guys and it is incredible to be on the same team as Adam Peaty and James Guy,” she said.